We are really gardening now at the Annex! Vegies include Potatoes, Onions, Squash, Tomatoes, and Peppers, each in their own raised bed. Many of the perennial gardens are planted, and the pathways are filling out. This Saturday, June 16th, we’ll be holding a special workday from 9am until noon, concentrating on finishing the pathway from the main Annex area out to 57th Avenue. It will be mostly moving gravel, but there are a number of other jobs that are available to someone uninterested in paths. I encourage you to come out and help! Both the Annex and the original garden are engaged in a bit of sprucing up. The following Saturday, June 23rd from 10am until 2pm both gardens will be on the “Share your Garden” tour, and we’d like to look good. You are definitely encouraged to visit the gardens during those hours to get an overall picture of how we are doing. To give you an idea how hard our gardeners work, I offer this picture of two folks engaged in the planning process for the new herb garden. Saturday, March 19th, we’ll have a special workday at the Annex. We’ll be doing a lot of planting in perennial beds, caring for those plants already in the ground, spreading mulch, and working on the new path running over to 57th Avenue. This is a great opportunity to help the Annex along while getting some Saturday volunteer hours. We’ll be there from 9am until noon at least. The Annex is really coming together. We’re not just building now, we’re gardening. We’ve got hundreds of plants in the perennial beds, and three raised beds built and planted with vegies that will supplement the production of the original garden. Come help us develop and operate this great place! You say you don’t believe me? My lousy, ground-level pictures haven’t convince you that a lot has been accomplished? Enter Pablo Llambias, a hard-working intern who just happens to own a camera-equipped drone. Check out these pictures! South is up. Now do you believe me? So get out here and help finish the paths and spread mulch over the weeds. We’ve got plants that want that space! Here is a picture of a Master Gardener at the intersection of Jacobsen Drive and Frankel Way in the garden formerly known as the Annex. Note the snazzy raised bed in the foreground, constructed at last Saturday's "workshop", formerly known as a hands-on experience (or is it the other way around?). Note the ADA compliant quarter-10 gravel along the paths. It's happening people!! Most of you have heard by now that the donated greenhouse we were expecting has fallen through (not a good thing to happen to a greenhouse!). We’re back to looking. Our original plan was for a greenhouse that was 30’ wide by 40’ long, doors on both ends, and either fans for cooling or (preferably) a ridge vent the length of the greenhouse. The city has made it clear that it must pass the structural requirements of a “normal” building, which basically means a snow load of 25 pounds per square foot, and wind velocities of 70 mph. That turns out to eliminate a lot of potential greenhouses. If you’ve got ideas on this topic, send them to DemoGardenNews@gmail.com, and thanks! A reminder that our first “class” offered at the Annex will be on Building Raised Beds, offered Saturday, March 10th from 10am until noon. The current weather report (I know, a long way off) is for 57 degrees and cloudy, and about the same for the day before and after. Hoping… If you’d like to come, send a note to DemoGardenNews@gmail.com - its open to the public. The Annex desperately needs a few dry days so we can continue to work on the paths. We’re hoping to get more paths graveled before the Raised Bed Class on the 10th. Having Thursday’s will help. Come and play with us! The Annex saw a lot of development this past year, with all of the planned perennial beds at least mulched for the winter, and some plants in nursery beds ready for spring planting. The major paths were dug out, and the path borders installed in some areas. We also covered the driveway turn-around with gravel, although that will be extended somewhat next spring. Work will probably begin again at the Annex in February whenever the rains permit. We’ll hold another… what?... seminar? (we can’t say workshop) on building raised beds as we start building the many new beds needed. Watch for notice in DemoGardenNews, another listserv you should consider joining. Send "Sign me up" to DemoGardenNews@gmail.com. The biggest news of the year will need to wait a bit for final confirmation. We hope to receive the donation of a large greenhouse for the annex. There is hope for a stronger statement in the February eNews. We've been working hard, but sometimes it is difficult to demonstrate progress. I'm including a picture of one part that hopefully gives you a sense of what the whole might someday be. It isn't planted yet, but is looking a lot like a garden! We said good night to the garden for the Winter although the Annex crew may hold a few additional work days, but it will depend on the weather. If you are a bed designer and are working in the Annex, please keep the gate closed and locked while you work, for your safety. We have a final wrap up meeting at the Woodstock Wine and Deli on November 16th, at 12:30. Bed designers will give an overview of what they had hoped to accomplish in their beds and whether they met their goals. Come join us, it is always fun and informative. The Deli is located at 4030 SE Woodstock. Winding down . . . or not? We recognized that Annex bed set up and path installation need more time than we'll have through Monday, 11/6, the planned final work day for the DG, so Pete has agreed to circulate announcement of work sessions with a call for workers on selected days over the winter. If you would like to have a work session, please contact him. In general, an MG should not work in either garden on an unscheduled basis [i.e., no one else knowing they plan to work there]. This is for liability & security reasons. Our neighbors at PPS are particularly sensitive about unidentified persons on the premises, so please wear your name tag when you do go there. Monday was a very busy day at the garden. Workers in the Annex prepared beds for sowing cover crops, did some lasagna mulching, rototilled, removed large stones, worked on paths and repaired the water valve box that a somewhat unskilled pruning truck driver managed to drive over and damage. There is still lots of work to be done in the Annex, so watch for notices of a work day when weather permits. Donations of cardboard, especially large pieces, for lasagna mulching would be most appreciated. Please contact Pete Jacobsen if you have some you no longer need. Monday, November 6 will be our last day in the garden for 2017. We’ll start up again in February and hope to see you then. Gardeners continued winterizing beds with leaves and burlap and sowed more Austrian peas and Morida oats in bare spots in beds with cover crops. In the Annex, soil was moved, paths dug, and two exciting new areas – beneficial insect hedgerow and native bed – were cleared and prepared. For those MGs who have a Fred Meyer Rewards card that is linked to Multnomah County Master Gardeners, please check to be sure the link is still in force. Some time ago, Fred Meyer cleared all its links and asked people to re-enroll. If you didn't do this, your purchases may no longer be benefitting the chapter. To check, please go to https://www.fredmeyer.com/topic/community-rewards-4 . In the section headed 'Are you a Fred Meyer Customer?' there is a link that says 'Re-enroll or link your rewards card now.' Click on this link and follow the directions for linking your card. The number for Multnomah County Master Gardeners is 89982. If you don't currently have a FM Rewards card, please consider getting one. Linking your card to the Chapter does not in any way affect the other benefits you receive from having it. Many thanks for sharing with the Chapter. Monday, November 6, will be our last official work day although we may hear about a special work day for an Annex project or two. On November 16 we will have our annual end-of-gardening-season gathering at the Deli to re-cap the season, share what we've learned, and celebrate our successes. Come join our final work days to help the Annex take shape . 30, Nov. 2, and Nov. 6, from 9:00 until about noon, 6801 SE 60th Avenue, Portland, across from Brentwood Park. Today Rich installed the tool holders in the new Annex shed, and we started working on straightening things up in the garden shed and outside the greenhouse. Thursday we will be working on the paths in the new Annex, so if you’re dying to try your hand at guiding the path digger (I’m sure it has a name, but I don’t know what it is), do join us on Thursday. For those somewhat less adventurous, we will be completing the winterization of beds in the DG and cleaning up the greenhouse and shed. Putting the Annex to Bed? Further progress has been made at the Annex. Perennial bed designers can be seen turning around in circles in their newly assigned beds. Several have asked for cardboard and wood chips on their beds through the winter. Some have asked for more dirt formed into hills or berms. Lots of work to do! The Dingo rental went well, although the machine had a bit of a learning curve. 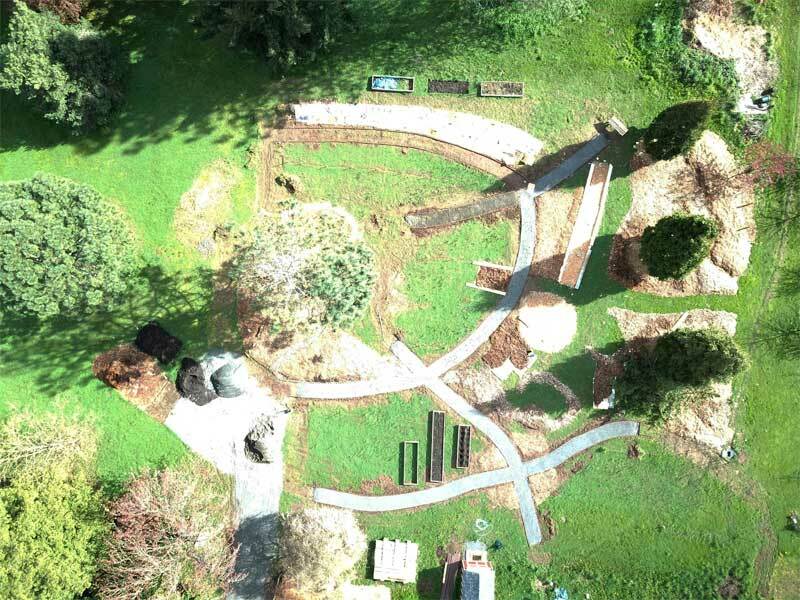 Several of us gave it a try, and we managed to dig up all the major paths in the new garden area. It may be a bit confusing to designers with adjacent beds, because we dug up an area closer to 6’ wide instead of 4’. The next step on the paths is to move the loosened dirt from the middle 4’ Some of this will be done by hand, but if the weather predictions hold for clear skies next week, the Dingo will probably return next Thursday (October 26th) to help dig out the dirt. You’ve got another chance to try it out if you weren’t able to come last Monday. As the rains arrive and volunteers start thinking about reading books and taking naps instead of gardening, it gets a little difficult to schedule activities. We made some decisions Thursday, while huddled in Greenhouse 5 away from the rain. Coming quickly, we’ll put a supply of cardboard in the new shed (some is there already) and dump a big pile of wood chips in the area that will eventually be the outdoor classroom. That’s a central area, and chips are light enough to wheelbarrow to individual beds. We’ll start hand digging the paths close to perennial beds needing cardboard and chips so the extra dirt will be at the bottom. We’ll purchase the (expensive!) steel border pieces, and start a team constructing the actual paths and filling them with gravel. I’m really looking forward to seeing the first actual completed path section! I hope you’ll join us when you can! The Annex is moving forward. Paths were being excavated today and beds are being planned. Come join us at the garden and the annex, see what all the excitement is about! We will work up until Thanksgiving - Monday and Thursday work days, 9 AM to noon. The garden is located at 6801 SE 60thAvenue across from Brentwood Park. In the Annex, the shed construction crew began painting the inside of the shed. Pete Jacobsen has also built 3 raised beds at the annex for temporarily housing perennials destined for future perennial beds in the annex. Come join us at the garden and the annex – October is a great month to garden! We will work up until Thanksgiving - Monday and Thursday work days, 9 AM to noon. The garden is located at 6801 SE 60th Avenue across from Brentwood Park. After two months simmering beneath clear sheets of plastic, the weeds in the new annex are… well, not gone, but small. Interestingly, there were small sections that almost flourished, and other areas that seemed to be sprouting new weeds. Alas, the plastic had degraded so badly in the sun that it could not be reused. I’d call our attempt at solarization… hmmm… interesting? educational? How about OVER! We’ve put yellow flags out where our new, ADA compliant gravel paths will go. To my eye, it makes it seem real. You can walk along the path and say, “Ah, that’s were the herb swirl will go”, or “See how it converges on the presentation area?”. We have a design team led by Nancy Fineworking on the individual beds set aside for perennials. We have a soil committee deciding what the best approach to amendment is for the various areas. We have purchased and assembled a 8’ x 12’ shed instead of a shipping container, saving more than a $1000 compared to budgeted amount, and $2000 compared to current cost of those containers! In the next week or so we will be building some nursery beds to allow us to take advantage of sales coming up soon. We’ll acquire desirable plants and place them in the nursery until their destination beds are ready to accept them. We’ll also be planting our swamp rose hedge soon, which will eventually block our view of a debris pile. Our next major project will be constructing the ADA compliant paths. Stay tuned! The greenhouse in Vancouver is in limbo. The assembly/moving team is too busy to give me a quote, and the owner apparently needs the blessing of tons of people to give the thing away. I will continue to prod gently. We’ve been waiting… waiting for the sun to do some work for us! The new garden is resting under a covering of clear plastic, and when the air temperature gets into the 90s, the weeds under that plastic are cooking… we hope. Soon those 90 degree days will be behind us, and it will be time to roll back the plastic to reveal our new garden space. Just as the team of volunteers shown above watered the ground (to help the nasty weeds to germinate) and then spread the plastic, we’ll need help to remove the plastic and spread some amendments (i.e. food for plants). Watch for notice of a workday in the last half of September. The exciting thing about removing the plastic is that we are almost ready to plant many of the areas planned for perennials. We have many proposed “beds” that need the thinking of a Master Gardener to plan their contents. Yeah, I’m talking to you! If you’ve ever wanted to start from scratch with a new area, and have other gardeners willing to help with the work to execute your ideas, you’ve got a great opportunity! Send a note to DemoGardenPlanning@gmail.com, and I’ll pass it on to our design team. We’d love to have your help! Big things will come up soon: We’ll be assembling a 12’ x 8’ shed on the North edge of the garden to store tools. We’ll be constructing the 4’ wide ADA compliant paths through the garden area. And maybe, just maybe, we’ll be putting in a 48’ x 30’ greenhouse! We are working with an organization that doesn’t want their almost new greenhouse, and hoping to have it dismantled and re-constructed on our site. Well, not quite an acre, but a lot of ground. The annex will now cook under the summer sun for a couple months. When we remove the plastic, we'll amend the soil with some compost (and maybe some lime). Then it will be time to think about (gasp!) Plants! Thanks to the team pictured below for donating their Saturday morning to the cause! The annex irrigation work is done, at least until we have installed the raised beds this fall. 760 feet of pipe, 25 risers, 6 hose bibs, and no leaks. Work is taking a short break as many of us have duties with the International Master Gardener Conference next week. Come visit the Trade Show and check out the orange aprons that will identify the volunteers. Alas, that puts us behind schedule! We want to use the hot sun to kill off all our weeds (ok, how about many of our weeds?) using a process called solarization. Starting Monday, July 17th, we’ll be tilling the annex to torture the current crop of weeds and bring other weed seeds to the surface. On Thursday, July 20th, I’m hoping a team of volunteers will help pick up the rocks that will also be turned up by the tilling. As soon as that’s done, we’ll water the whole area thoroughly to help those new weed seeds germinate. On Saturday, July 22nd, we’ll cover the area with clear plastic. 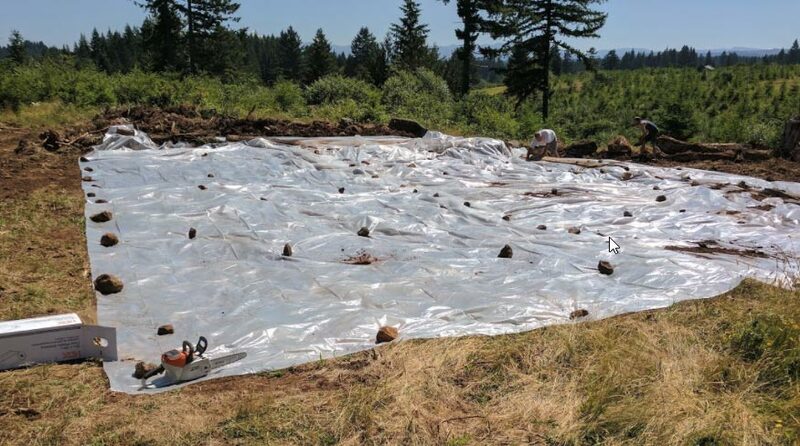 With good sun for the next two months, the temperatures under the plastic will get sufficiently high to kill off those sprouting weeds, leaving us beds ready for planting. We hoped to offer a class on solarization, but we don’t have the necessary preparation time. However, if you are interested in an organic method for getting a weedy area ready for planting, come to our workday on Saturday, July 22nd. We’ll certainly describe what we are doing and why, and what we would be doing if we were a month earlier. You can watch it happen. Actually, you can make it happen!